Payments on Love Factory consist of users buying memberships for the things they offer like uploading more photos, adding more friends or creating groups. 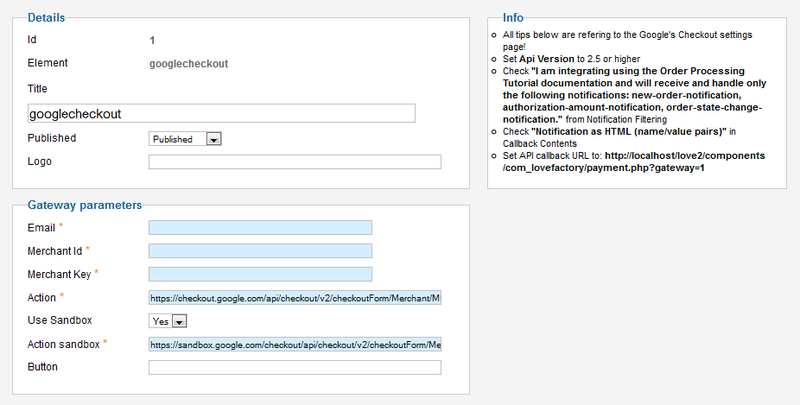 To see how a simple payment looks like on the frontend go to "Memberships" on the user menu. 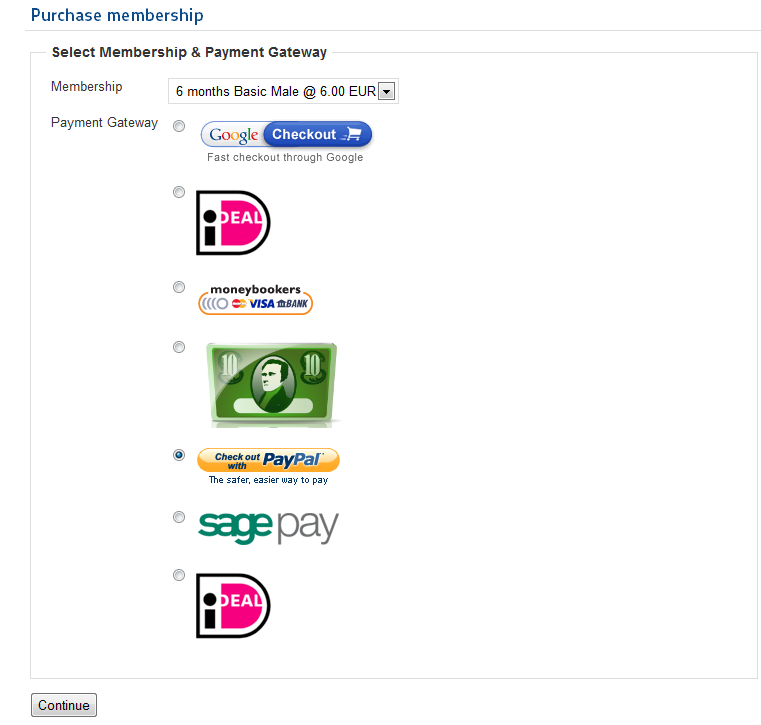 There you can see all the categories of the memberships along with the prices for them. Click on the price to continue with the payment. Next step is choosing the payment method. After you have done that, click "Continue"
After the confirmation, you will be redirected to the payment gateway site to complete the payment. By going to "Orders" in the backend you should see the order generated by the previous payment, if required, orders can be accepted or declined manually. If using IPNs this happens automatically. 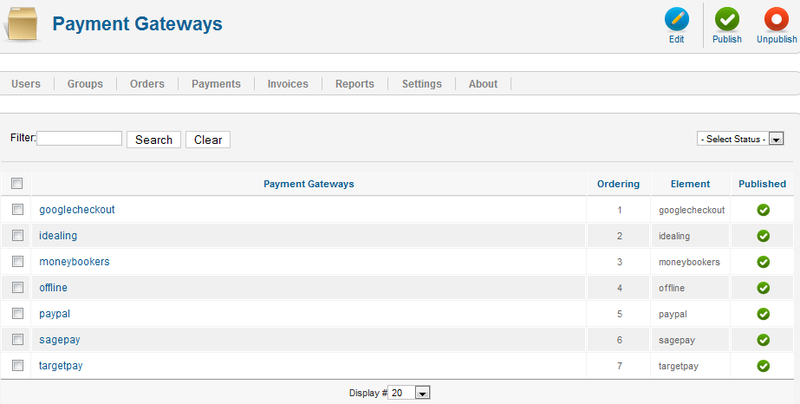 In the "Payments" tab you will find all the payments already made and processed by the gateways. 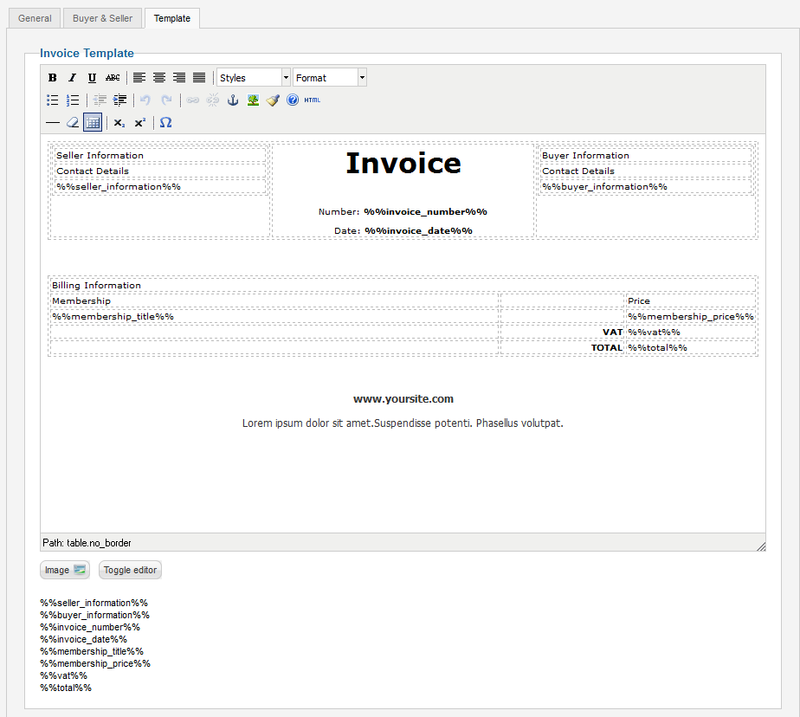 "Invoices" tab allows you to check the invoices for all the payments and gives you the option to export them as ".csv" files. To modify the options for Invoices simply go to Settings and click on "Invoices", there you will find 3 tabs. In the first one you can enable or disable the Invoices and set a VAT (Value added tax) rate. Next tab allows you to change the details for seller and buyer on the invoices. 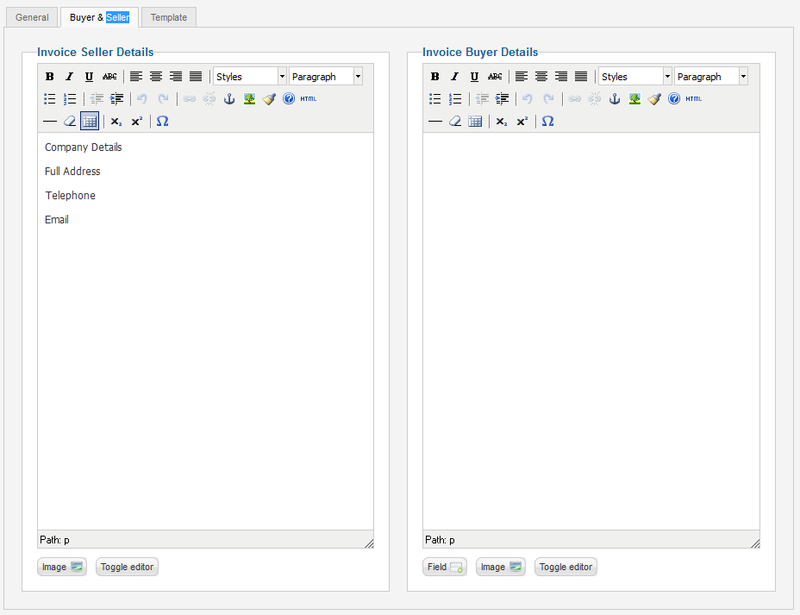 The last tab allows you to edit the Invoice template. "Love Factory" comes with 7 payment gateways already implemented, by going to Settings and clicking on Payment Gateways you can enable, disable or edit them. You can change the logo, publish it or unpublish it and add the required gateway parameters. Also you can choose to use a sandbox for it. You can change the title, logo and if you publish it or not along the required gateway parameters. Also you can enable the test mode. You can change the details like the title, logo or if you wish to publish it or not along with the required gateway parameters like email and action. You can change details like the title, logo or if you wish to publish it or not along with a text field for bank details or the option to send email notifications. You can change details like the title, logo or if you wish to publish it or not along with parameters like email, action, button link and the option to use sandbox. 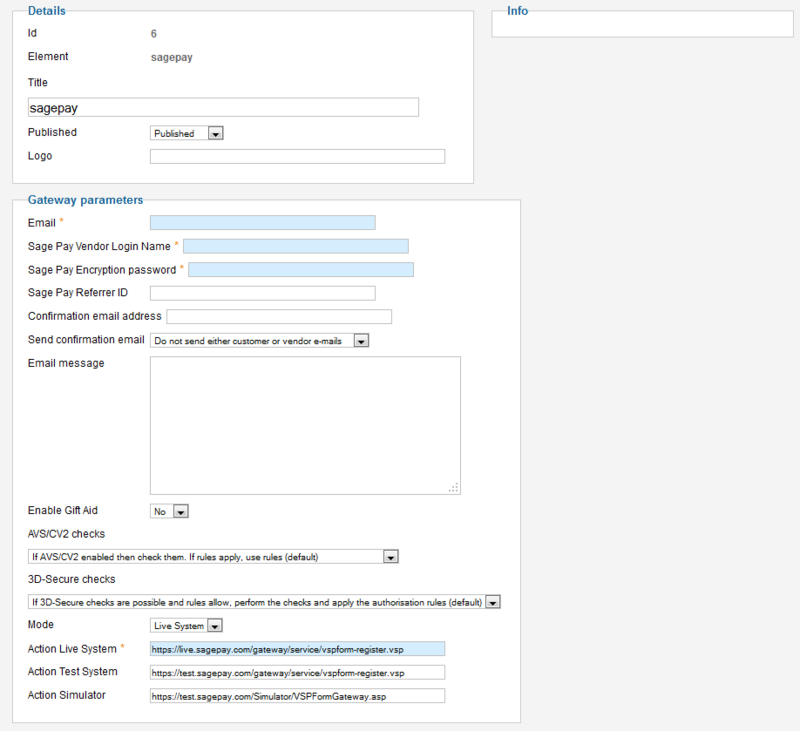 For Sage Pay, besides the logo, title and publish/unpublish fields you have many gateway parameters to set like email, a vendor login name, password and some optional ones like to enable gift aid, switching between live system, test system or simulator and more. 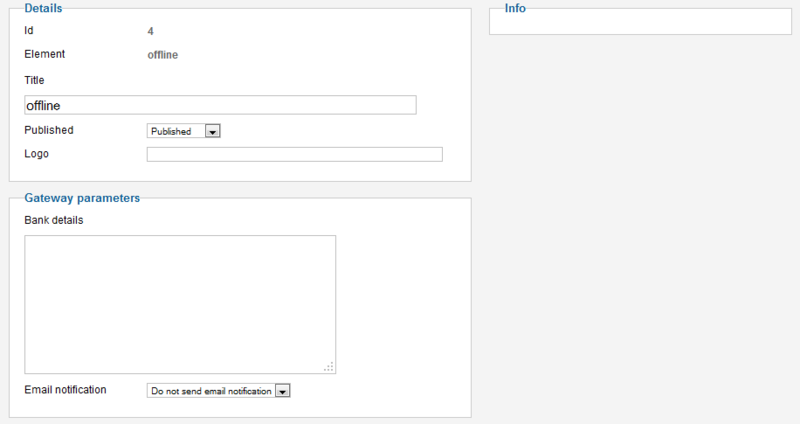 Here you can set the title, logo and publish/unpublish besides adding the required Layoutcode.